Who doesn't love denim? 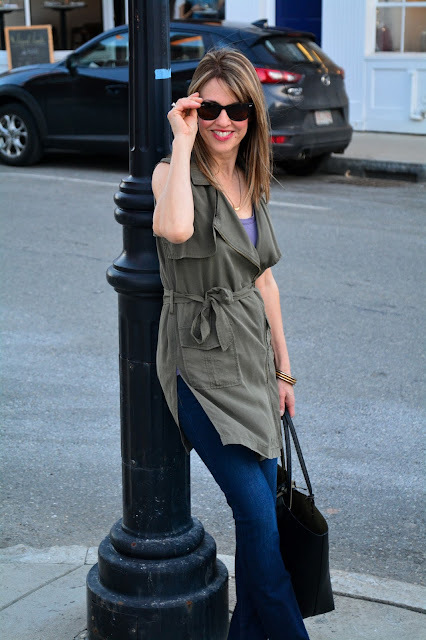 I'm a huge fan of "the jean" myself--I could live in them! I recently had the opportunity to "play dress ups" at Izzy's Emporium in Andover, MA--a super sweet little boutique with a very down to earth feel. The owner Jennifer Ginty is truly an expert jean fitter. As a matter of fact, Izzys is known as "THE" place to buy denim! Although this photo shoot was taken the day I fractured my hand (I didn't know it was broken), the pain didn't stop me from trying on clothes! 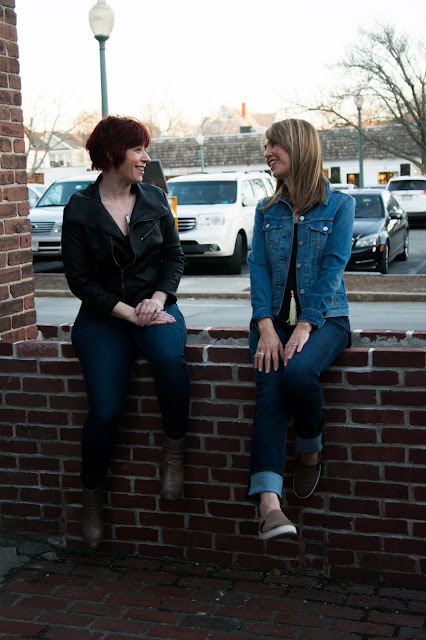 I want to show you two very different looks using one versatile pair of Liverpool "The Hugger" straight jeans--honestly they fit to perfection. 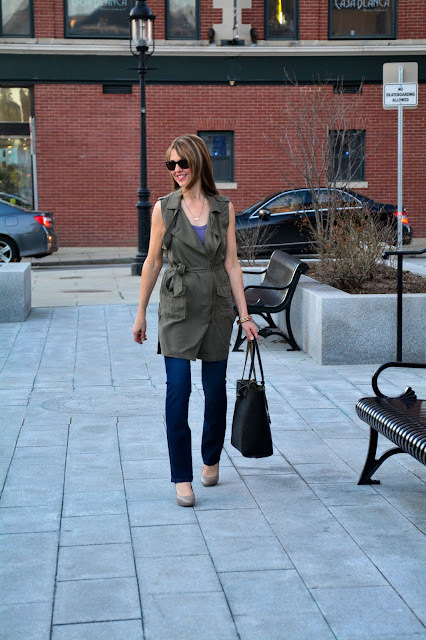 This Dex Khaki Moto Waistcoat is so fabulous--I fell in love with it. 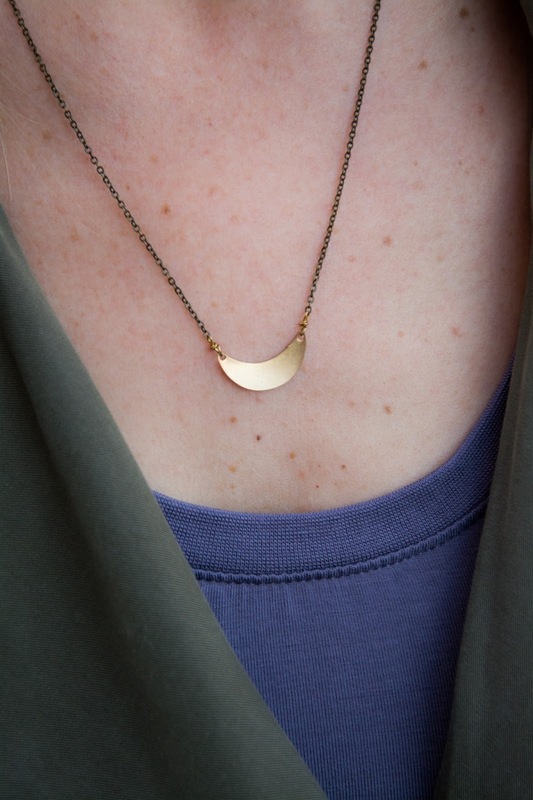 It's the perfect addition to jeans or pretty much any outfit! This look is so polished and could easily work for casual Fridays or pretty much any occasion. If the weather isn't warm enough for sleeveless, just add a long sleeve tee. By the way, the day we shot this blog it was almost 70 degrees!!! Great tanks are hard to find, but this Z Supply Sleek Jersey Tank fits like a glove and is the perfect length--we need this piece in every color! Enamel bangles and Sydney Love 3 in 1 reversible tote bag complete the look. This necklace is by Trust Jewelry, a collection inspired by the designer Tanya Rustigan's passion for cultivating the Bohemian life. Next up I've taken the same pair of Liverpool straight leg jeans and cuffed them up to create more of a relaxed "boyfriend" look. Easy-peasy--two looks from the same pair of jeans. 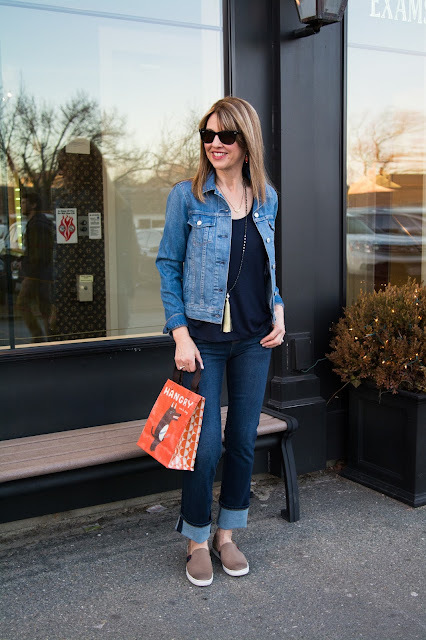 Since this look is more casual and laid-back, we paired the jeans with a Levi's Trucker denim jacket and a Dex navy tank top (with a nice little flow--cling free baby!). This fun little tote is by Blue Q. Doesn't it just make you smile? 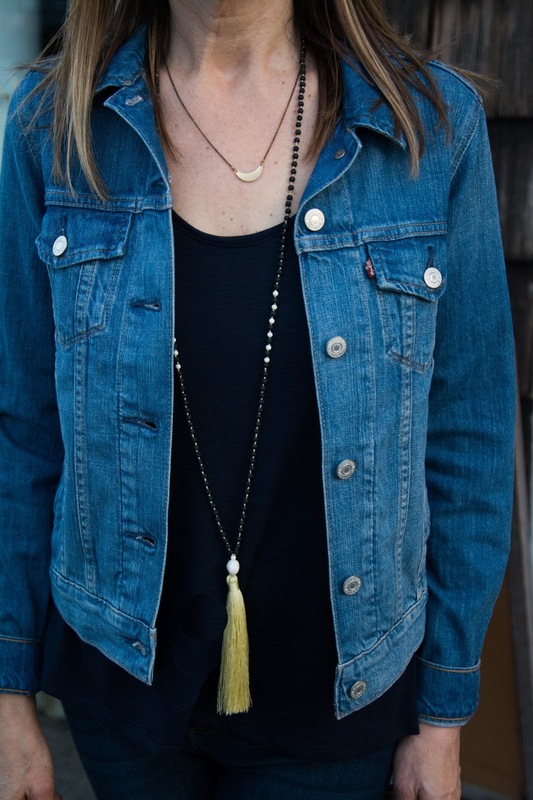 I love how this skull tassel necklace layers so effortlessly with the same Trust necklace. Meet Izzy's owner Jen Ginty. 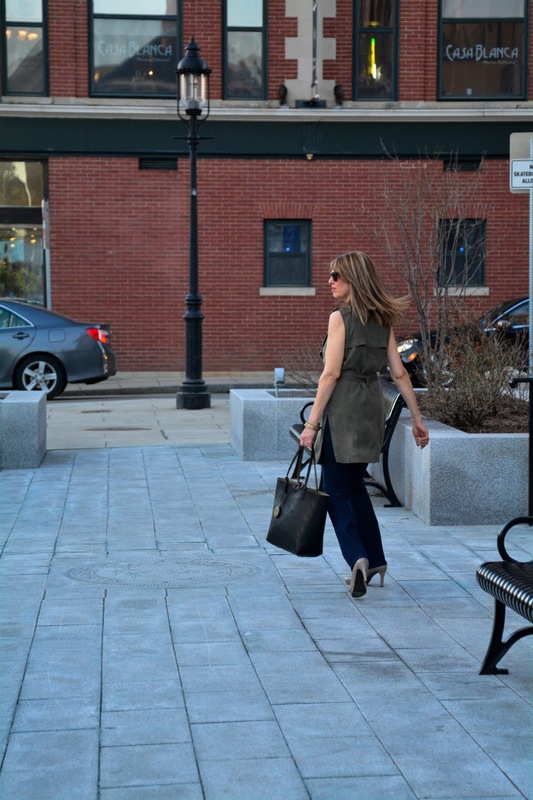 Here are some of her personal tips for jean shopping. *Don’t push yourself through trying on a lot of jeans since it leads to frustration (and sometimes tears!). When you find yourself feeling overwhelmed, step back and try again another time. There’s no use in stressing yourself over something you should be comfortable in. You will not want to wear a pair of jeans you bought only because you had to buy SOMETHING. *Women’s sizing is not consistent - just because one brand fits a certain way does not mean you will be the same size in another brand. It’s just a number, so go by how you feel in them and not what digit they sewed on the tag. *Don’t box yourself into one specific style - the color, or the stitching, or what’s on the pocket (or isn’t). If you go in with the idea of exactly what the jeans SHOULD look like, you may find yourself disappointed when you don’t like the way that style look on you. *Women often buy their jeans based on how comfortable they feel at that very moment they put them on without realizing that they will stretch. In many cases, the jeans should be the tightest they can be without feeling uncomfortable. *Bring a pair of shoes with you. Pick a pair that has the right heel height so you can see how long you really need them to be. The correct length is everything when it comes to jeans - and the right tailor will reattach the original hem. If you're not in the area, you can shop Izzy's online. All of the pieces in the blog can be ordered (if in stock). This post was sponsored by Izzy's Emporium. However, the content of my posts are based on my own honest opinions and are not in any way influenced by partnerships. Adorable! What a great and versatile vest too! You look great!